Iceland is the British supermarket chain known for its frozen foods range and ‘clear cut’ prices. Each of the 660-plus Iceland stores in the UK focuses on offering shoppers a wide range of frozen foods such as frozen prepared meals and frozen vegetables. Consumer durables such as freezers and refrigerators can also be found in the supermarket’s larger stores. The first Iceland store was opened for business in November 1970 by Malcolm Walker and his business partners in Shropshire after they managed to raise £60 to cover one month’s rent. After being fired from their day jobs at Woolworths, the partners put all their efforts into developing the Iceland food retail business, and started off by specialising in loose frozen food. By 1975, there were 15 Iceland stores in North Wales and the North West . The company gradually moved away from loose frozen food and opened its first purpose-built freezer centre in Manchester in 1977. New store openings and the acquisition of smaller chains led to the company operating 81 stores by 1984 – the same year it was floated on the London Stock Exchange. In 1989 Iceland bought its major competitor Bejam, which at the time was three times the size of Iceland in terms of business. The acquisition gave Iceland a national presence with a chain of 465 stores. By 1995 its store portfolio had increased to 752, but the company began to feel the pressure from its main supermarket rivals. In response Iceland launched an innovation programme, which included the introduction of a free, nationwide home delivery service and the development of new products including own-brand foods free from GM ingredients. After 21 years on the stock market, Iceland became a private company once more in 2005 after an offer for the business by a consortium, led by Icelandic investment group Baugur, was accepted by shareholders of The Big Food Group (the name given to the combined Iceland-Booker business in 2002, which consequently led to a decline in sales). Malcolm Walker, who had been forced to leave the business along with many other senior executives in 2001, was put in charge of repairing the damage that had been done by the Booker cash-and-carry acquisition and restoring the company’s fortunes. 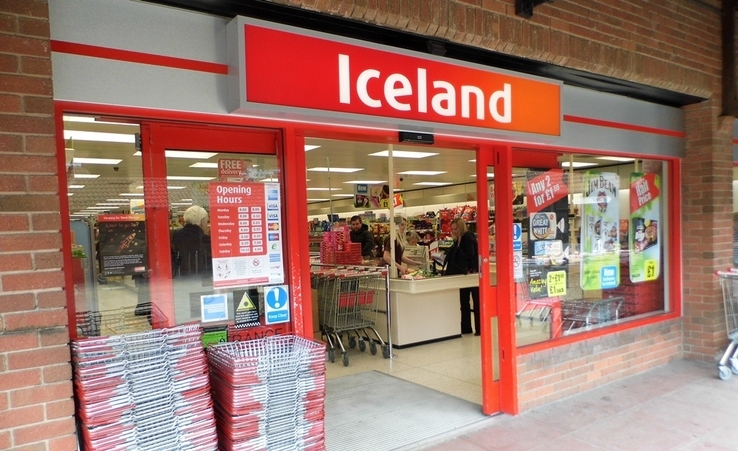 Iceland has launched a range of promotions over the years, from its ‘Buy One Get One Free’ to its Meal Deals offers (a selection of goods at a set price). Iceland is also famous for the way it prices its products. In a bid to simplify pricing the company introduced ‘Clear Cut Prices’, which saw the cost of many products being rounded up or down to the nearest multiple of 25p, i.e. £1.29 became £1.25. Iceland ’s free Home Delivery service was launched at the end of the 1990’s. The service covers the whole of the UK and has become one of the main focuses of the company following a massive promotion of the service in 2006. Customers that spend £25 or more on their groceries can choose to have them delivered to their home on the same day, free of charge. Iceland ’s range of branded fridges, freezers and fridge freezers are also included in the nationwide delivery service, with deliveries usually made within 2 working days of the purchase date. In October 2008, Iceland replaced its original home delivery card with the launch of the Bonus Loyalty Card, following a successful trial in parts of the UK. Customers who register for the new card receive offers and coupons from time to time. In addition, shoppers who use their Bonus card are automatically entered into a monthly prize draw to win £5,000 in cash, as well as several other prizes. At the start of 2009 Iceland announced that it would increase its store portfolio with the purchase of 51 stores from the failed Woolworths chain. The announcement came just three days after the final 200 Woolworths stores shut down for good following administration woes and failure to find a buyer. Iceland is famously known for its stand-out slogans such as ‘Mums Love It’ and the current ‘So that’s why mums go to Iceland’. In recent years, the company’s £8m-a-year TV advertising has been fronted by television personality Kerry Katona. The reality TV star continues to be the face of Iceland’s advertising campaign despite concerns about her public behaviour following her bizarre appearance on ITV’s This Morning programme in October 2008. The Iceland brand was also promoted through its major sponsorship of the 2006, 2007 and 2008 series of reality TV show ‘I’m a Celebrity…Get Me Out of Here!’ – a show which Kerry featured in and won in 2004.